Yes, Magic Bounce. You may have not heard of this one before, and for good reason. It’s rare. Like, really rare. As in, only three pokémon can have it, over two evolutionary families, and only in the Dream World rare. But we’ll worry about candidates later. Let’s see what this sucker can do. For all intents and purposes, it’s a Magic Coat that’s always in effect. Whenever the opponent attacks you with a move that would affect your pokémon’s stats, lay a trap, or inflict a status ailment, Magic Bounce will shield your pokémon from the effects, and sends them right back at the user! The opponent can still buff itself with Double Team, Swords Dance, etc, but they can’t affect your stats directly. The only catch is that an opponent with Mold Breaker, Teravolt, or Turboblaze will be impervious to Magic Bounce. So, as previously stated, it’s tough to get your grubby little paws on a monster with Magic Bounce. First of all, a trip into the Dream World is a prerequisite. From there you’ll have to either snag yourself a Natu, or an Eevee and evolve it into an Espeon. You should definitely lead with your Magic Bouncer if you see the opponent packing a popular trap-layer, like Forretress or Skarmory. In the event that the opponent doesn’t have a Spiker, with luck, your opponent will start by trying to debuff you, which of course, they’ll be unable to do, and take a chunk out of their own stats at the same time. Take the opportunity to start the battle with a Calm Mind to increase your Special stats, and both Xatu and Espeon have access to the attack. Unfortunately, once Magic Bounce does its job once, the jig is up, so it’s difficult, to say the least, plot a strategy around the Ability. To counteract the effects of Magic Bounce, an opponent might try increasing their own stats rather than destroying yours. Consider packing a Power Swap or Psych Up to copy their increases, or in the case of Xatu, Haze to make their stat manipulation all for naught. 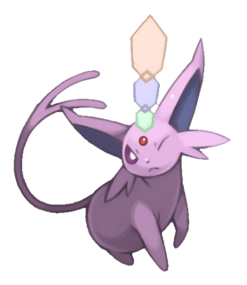 I think that the soundest strategy might be to run a Baton Passing monster on your team, outfit it with Calm Mind, and use it to pass +6 Special Attack and Special Defense onto an Espeon, and then just let it run wild without fear of removing your buffs. No reason that this idea wouldn’t work with Xatu, it’s Special Attack just isn’t quite as good as Espeon’s. I think it’s pretty clear that Magic Bounce shouldn’t be the crux of your strategy, but it’s certainly something you can have some fun with. Take a trip to the Dream World to snag a monster that has it and give it a whirl!